Paul and I took our traditional end-of-the-season trip to south county. Usually, we like to wait for a warmer, rainy day, but we are having one beautiful, chilly, sunny late fall day after another. Great for raking leaves, but not as great for fishing. 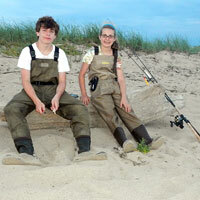 We fished the Quonnie Breachway, Weekapaug Point and a spot at the north end of East Beach. I caught a 13" striper on a 2 oz popper and that was it. Every part of the shore looked a little different than the last time I was there and we saw some of the real devastation when we tried to drive from Weekapaug to the Andrea Hotel. 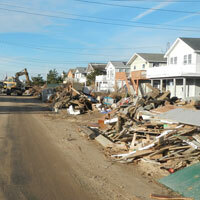 Atlantic Ave., just north of Weekapaug, after superstorm Sandy. My dad and I used to fish jetties a lot when I was a kid on Long Island, but I haven't fished a jetty in years. But two different fisherman told me that the breakwater at Old Harbor was a great November spot and I hadn't been having much luck at my usual places. So, at 4:00 I walked out to the end of the long breakwater. I fished the end and both sides for a couple hours and then cast from Ballard's Beach for a while and I had no action at all. I drove all the way to the northern top of the island and walked out to Grove Point on a dark night. I hadn't been to Grove Point since the storm so I wasn't sure what my surroundings or the structure looked like since it was so dark. On my 2nd cast with a blk/purple superstrike needle I got a nice tap. On my 5th cast, I hooked a decent fish and landed a nice 37" striper. Fifty more casts and not a hit. 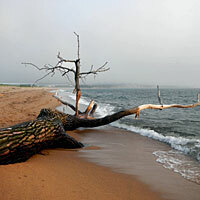 I moved to the north side of the point and walked the beach casting - nothing. I was happy to get that 20 lb fish, but I couldn't believe there was no more action. With the nice weather forecast, my wife and I talked the kids into spending Veteran's Day weekend on BI. 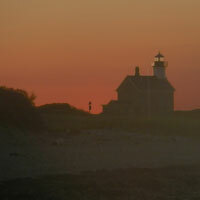 On Sunday night, with a new moon and SW wind, I headed to a favorite spot near Cow Cove at sunset with high expectations. I threw poppers while the sun set and needles and swimmers when it got dark and I never even got a tap. Skunked. 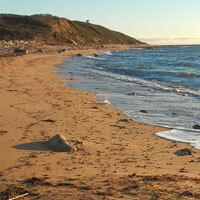 The beach at Cow Cove was also changed a great deal by Hurricane Sandy. I didn't get out until 6:30, but I was lucky and it was heavily overcast. 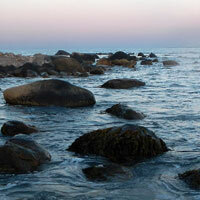 With the start of an incoming tide, I headed to Black Rock. The water was a little flat but, otherwise, the conditions were great. Casting from a great rock, I had the wind behind me and I could throw my plug a mile. My first cast with a white 2oz pencil drew a small hit. Second cast and I hooked up at the same spot and landed a nice fat 33" striper. I figured I was in for an hour of great action. All I got after that was a schoolie. I even tried a couple other nearby spots. Oh well, I'm always happy to bring home fresh striped bass in November. 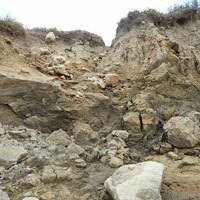 The scramble down to Black Rock after hurricane Sandy. A quick one night trip to BI to check on my property. 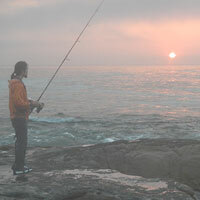 I fished sunset at SW Point. I've often mentioned the difficult walk out to the point over a very rocky beach. The storm surge from Sandy had washed all the rocks above the normal high-tide line so now it's an easy walk on firm sand. Fishing was dead. I walked a few hundred yards south and fished for a half hour off a great rock. Dead there too. I drove to Ballard's Beach and fished for another hour in the dark with needles and swimmers. Not a hit. 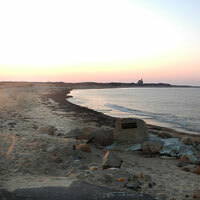 Hurricane Sandy changed the rocky walk out to SW Point. 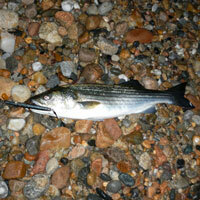 Just like Monday, I started at Quonnie and caught a couple very small stripers. I moved to Weekapaug and fished the the rocky point for an hour in great conditions with no luck at all. 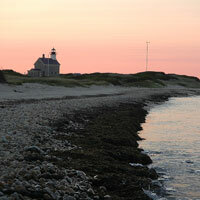 When I pulled up at Watch Hill Light, there was a feed close to the rocks. It was a mix of small blues and bass and they hung around for about an hour. I got a couple of each. I looked at Weekapaug and Quonnie one more time and then drove home. The view looking south from the rocks at Weekapaug Point. First trip this season to south county. Of course, all the guys told me I missed three great days last week. 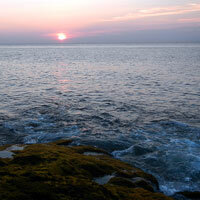 As usual, I started in the dark at the rocks near the Quonnie Breachway. No luck and no birds when the sun came up. I had one small bass hit on a needle. So, I moved south and checked Weekapaug and then the beaches along Atlantic Ave. All quiet. Finally, to the Watch Hill Lighthouse, where I fished for another hour without any action. As there often are, there were birds working off in the distance. Skunked this morning. 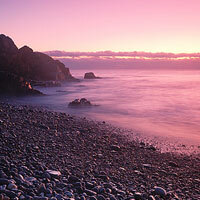 First light near the Quonnie Breachway. Sixteen hours of fishing and not a single fish. 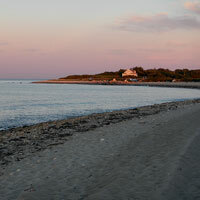 Dorry's Cove, Cow Cove, West Beach, SW Point, Black Rock, SW Point again, Cow Cove again, West Beach again, Grace's Cove and finally Sandy Point. Not even a schoolie. Zip. Jamie and I took the ferry from Pt. Judith on Thursday afternoon and Grigoriy joined us on BI on Friday morning. We fished two nights and two mornings. There was an unfavorable SE wind the whole time we were there, but the water wasn't weedy and it was plenty dark. We fished very hard. We fished live eels both nights plus every type of plug in our bags. I had a hit on a needle near Grove Pt. and a couple splashes at SW Pt. and that was it for the whole trip. The highlight of the trip was two breakfasts at Bethany's. It's a good thing I don't have to make a living as a guide. The top picture is Grigoriy and Jamie plugging Saturday morning at Sandy Point with the North Rip behind them. 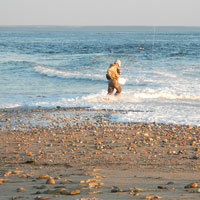 The bottom one is Jamie casting from a favorite rock of mine at Black Rock Point on Friday morning. I wanted to make my first trip of the season to RI - south county. But the big southerly wind kept me away. However, I wanted to fish, so I drove to the Canal despite a lousy morning tide. Behind the ice rink, it looked and felt like the first week of December. I was the only fisherman there and it was dead. I took a ride to the east end in Sandwich and caught some schoolies from 20 feet above the water on the docks. I could see a lot of birds working on the other side, so I drove across the bridge to Scusset Beach and hiked along the canal to the birds. The fish were about 22-26" and you could get one on almost every cast. 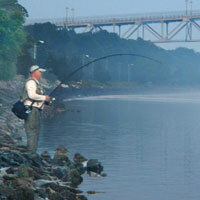 When it died, I followed the birds west and caught some more small bass near the Sagamore Bridge. At about 11:00 I called it a day. The color of the trees signals the end of the season is near. By Monday night I had the place to myself so I prepared for a long night of fishing. Problem was the 9:00 low tide. 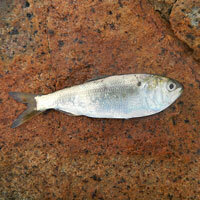 I started at Dories Cove at sunset and caught one tiny bluefish. I moved to the east side and fished behind Ballard's pretty hard for a couple hours with needles and swimmers. Never had a bump. It was only 8:30, but I threw in the towel. A view to the south from Dories Cove. On Sunday evening I sneaked out for an hour and fished Charleston Beach at sunset. The water was clean and it was easy to cast, but I never got a splash. Charleston Beach in the fall at sunset. We invited three families to join us Columbus Day weekend on BI and I went out on Friday, a day ahead of everyone. 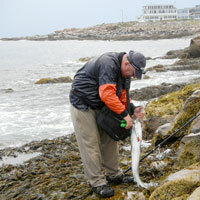 On Friday night I fished eels near Cow Cove hoping to serve fresh to our guests on Saturday. I got hits on my 2nd and 4th casts and then caught a 34" striper on my 6th cast. So, with an incoming tide, I figured it would be a good night. Nothing after that despite more than two additional hours of casting. Oh yeah - I did catch a snapper blue. At least I had a some fresh striped bass to serve. This snapper bluefish is barely bigger than the eel. Pushing my luck a little with Simona, I went to the Canal for the 3rd consecutive morning. I went back to the spot near the east end. It was foggy and drizzly again. The action started a little earlier, about 6:15, but was never as consistent as yesterday. However, fish periodically came through until I had to leave at about 8:30. Like yesterday, i managed to catch seven bass. Just like the past two days, they were decent size but not big. I started with a 28" fish and then the rest were between 32 and 35". Just before I left, I had a big crash hit and my first big fish on, but then it was gone..... figures. 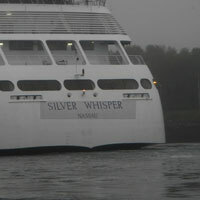 One of my cruise ships passes by on the Canal. I fished a spot at the east end of the Canal. As usual, it was dead until there was enough light to throw a popper. Then some fish started to break water. I had good action for over an hour. For a period, I had action on every cast. The fish weren't the jumbo size that you associate with the Canal. 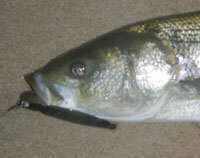 I caught seven bass between 28 and 36" - mostly 31-32". I also had 8-10 hits where I didn't hook-up. I used my 9 1/2 foot Lamiglas rod because it's a great casting rod. I was throwing my popper 20 yards further than the guys on either side of me and they each only got one fish. They gave me a hard time. A drizzly, foggy morning at the Canal. Paul and I fished the Canal behind the ice rink. First half hour was dead. At about 6:30 a few fish started breaking as they came through. They were very picky - even when I got hits they were half-hearted. Finally, with an olive colored pencil popper, I caught a 35" and a 32". Paul got a 33 incher. The action didn't last long. Paul fighting a Canal striper. 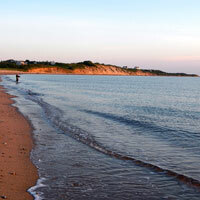 With a low tide, I put my waders on and fished the left side of Good Harbor Beach, along Salt Island. 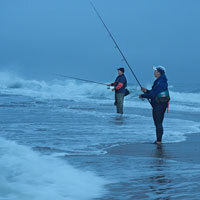 At first light, there was some nice action with big bluefish for a while. I got two blues that were around 12 lbs. The stormy weather made for a big surf on the back shore. After the big day on Wednesday, I thought there might be a lot of fisherman, so I got to my spot early and Grigoriy showed up soon after. A lot of birds filled the air at first light and there was a big feed off shore, but nothing ever materialized along the rocks. At about 7:00, a few fish came by and Grigoriy got a 35" bass and I got a 33. Nothing after that. Grigoriy unhooking the nice bass he caught this morning on the back shore. I finally quit at about noon and my left thumb was all torn up from unhooking and releasing so many good sized bass. This was one of those memorable days on the back shore. It didn't start that way. For over an hour in the dark I threw needles and swimmers and caught nothing. At about 6:30 I saw just a few birds working off another spot, about 300 yards to my right. I made the long walk and, of course, a big feed materialized at the spot that I had just left. I decided to wait for it to come to me and I started catching nice fish using a mackerel pattern pencil popper. The water was full of 2 1/2" peanut bunker and big bass and bluefish were feasting on them. Birds were working up and down the back shore. 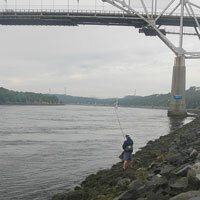 Between 7:00 and 9:00 I caught about ten stripers between 34 and 41 inches. Most were 35 to 36 inches. I also caught four bluefish from 10 to 14 lbs. My arms were tired. 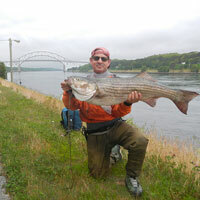 I took a break for coffee and to ice a 35" striper that I had kept. But I wasn't done because the birds were still working in a couple spots. I went back to the same spot where I had started more than four hours earlier. Birds were working right in front of me but now the fish weren't hitting my plug. When the birds moved on, the good fishing started again. I caught a couple more stripers between 34 and 36" and then I hooked a monster. I got a good look at it and it was huge. It made a long run and then got off when I started to turn it around. Damn. About 20 minutes later, after another couple bass, I hooked another big fish. This was the best fight I've had this season. Several long runs and some tricky work to get the big fish around some rocks. Finally, I won this time and a nice guy named Steve, who lives across the street, snapped a picture for me. Fat and a little over 43 inches - maybe 34 lbs. My best fish in a great morning of fishing. The top picture is of a baby menhaden that one of my fish coughed up - the"peanut bunker" that stripers so love. The bottom photo is my best fish of the morning. I was curious to try the Canal at nighttime when the current turns from west to east. I tried a variety of bucktails, soft plastics and swimmers. Bad idea. Totally dead. Not a bump. I slept late and didn't get to the Canal until almost 7:00 because the current turn that I like was at about that time. Grigoriy was there and I set up on his right. A few minutes later, Ron Arra (of long casting and Lamiglas fame) pulls up on his bike and sets up about 20 feet to my right. At the Canal, I like a little more space than that so I moved about 100 yards east, to Ron's right. Some nice fish came through between 7:30 and 8:30. 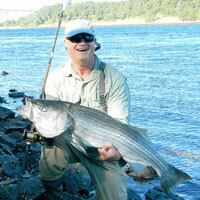 Ron Arra, with his big white popper and long casts, caught the biggest fish, including a nice 45-46" striper. 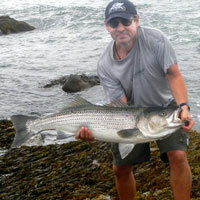 I regretted moving to Ron's right because I missed some fishing while he was fighting all those big stripers! My best was a fat 39 incher, plus a couple more keeper bass and a big bluefish. Grigoriy also got three fish. Ron asked me to snap a photo of him with the big bass so I included that photo in my report. I think he owes me one of those pretty pencil poppers of his. This big fish was one of several nice bass that Ron Arra caught this morning at the Canal. This was a pretty good morning of fishing at the Canal. Jamie and his dad had arrived before me and were fishing a couple hundred yards to my left. 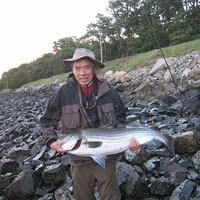 The best fish of the morning was landed by Jamie's dad, Al Wong, who was visiting from California. He caught a fat 42 inch striper that weighed over 30 lbs. It was hard to tell who was happier, Al for catching such a big fish, or Jamie for taking his dad to the right place at the right time. I think they got another three smaller bass. I caught three nice fish - all about 35-36" - all on the mackerel pattern popper. Here's Al Wong with his 42", 30+ lb Striped Bass. Just one night on BI with my family. I went out on Sunday morning and decided to walk out to Sandy Point because I had done well there earlier in the week. Not so good this time. A couple small bass just before first light and then nothing. Not even a couple bluefish. 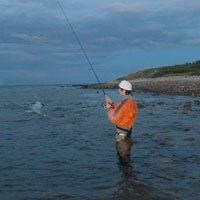 I should have skipped night fishing, gotten six hours sleep and gone back to Sandy point for more of that great action. Instead, I picked up some eels and hit my favorite spot as soon as it was dark. Perfect conditions - SW wind, little surf, pretty dark. I was ready for some 20 lb bass. Nothing. Not a schoolie. 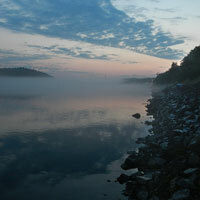 Then, of course, I couldn't get up in the morning when my alarm sounded at 4:30 so I didn't get to fish the rip again. Fooey. I went back to the same NE spot for the last of dark. I got three small stripers on a needlefish. Maybe one was a small keeper. Then I walked out to Sandy Point and fished the rip. I hadn't been out there in a while and I was thrilled to find the north rip full of hungry 24-27" bass. Every cast my popper barely touched the water before it was hammered. It was great fun and I caught 7 or 8 of them. 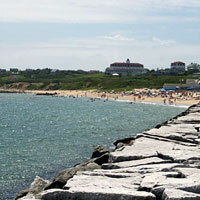 A quick trip to Block Island. The conditions were good that night for my favorite spot near Grove Point. I went early and threw a popper while the sun set. I got two small bluefish. After dark, with my trusty needlefish, a couple hits and a decent fish on for a few turns but didn't catch one fish. Fished some rocks on the back shore with a high tide and a rolling surf. Of course a wave came out of nowhere and completely soaked me. I got a small keeper on a black needle, then a 20" bass on a white needle and then a 12" bass on popper. Time to quit before I caught a fish smaller than my plug. I did get 3-4 more hits or swirls but I think they were all small bass. My family spent a lovely Labor Day weekend on Block Island. Got to the beach all three days. I only fished one morning. 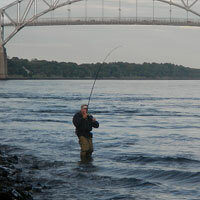 I went to a favorite spot (seven sisters) below SE Light where I've often had great top-water action with 30-36" stripers. Not so much the last couple seasons though. This morning I got only a small bass and an even smaller bluefish. The tide was dead low right at 5:20, so had to pick a spot with good water at low tide. Despite getting skunked on Wednesday, went back to the same backshore spot in Gloucester. Absolutely nothing this morning except a very pretty full moon. First light on the back shore. Fished another spot on the backshore in Gloucester. One hit on a needle while still dark and then nothing at all after that. 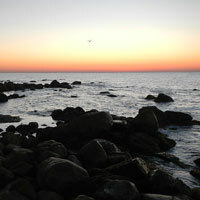 Sunrise along the rocks on Atlantic Rd. 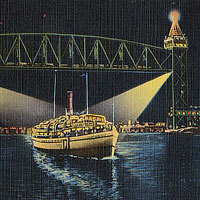 in Gloucester. Fished the backshore in Gloucester. No action while it was dark, but I caught a 34" striper at first light on a white Gibbs. That was it. Then, about a half hour later, some blues came through. I got one and missed another. This striper went right for the head of my 2 oz Gibbs pencil. I was going to fish the north shore, but I got an email from JW saying that it had been really dead there and he was heading to the Canal so I decided to do the same since there was a favorable morning tide. I had never fished the Canal in August, but I headed to my usual spot behind the ice rink. Right after the current turned, I hooked up and so did the guy on my right. I landed that fish, about 34", but dropped two more and missed a couple other hits. Guy on my right caught four nice stripers! I drove to the east part of the Canal and met Jamie but it had been dead there all morning. Jamie jigging near the east end of the Canal. Tried a spot on Marblehead Neck where I've had success in past summers. Fished the first couple hours of the incoming tide with no action at all. Completely dead. This was my last night of this trip. 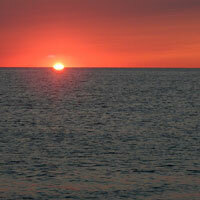 I fished two spots - one at sunset and another in darkness. I caught zero fish, but I had some good action at the second spot. I was going to go down the stairs and fish SE Light but I thought it might be weedy so I went back to Black Rock. I wish I had stuck with my plan. It was dead again at Black Rock. I wasn't going to fish at night, but the conditions were, for the first time, ideal for my favorite night spot. So, there I went. I put an olive colored needle on and everything felt really perfect as I waded in at about 9:30. On my 2nd cast, I got a nice hard hit. On my 5th cast, I got another that hit twice but didn't hook up. I cursed. I switched to a blk and purple needle and on my first cast a real good fish grabbed it. I had it on for a good minute and then it was off. Damn. In the next half hour I had one more miss and one more nice fish that I also dropped and then it died. That was it. I missed five pretty big fish - at least a couple 20 pounders. I said some more bad words and walked back to the car. 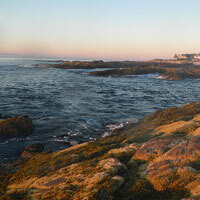 Another sunset at Black Rock Point. Skunked again. I fished around Grove Pt. while the sun set making long casts with a wind at my back. Not even a hit. I had picked up some eels, so I moved a little north to the other side of Settlers's Rock and fished the end of the flood tide in the darkness. I don't think I even got a tap on my eels. Pretty weird. 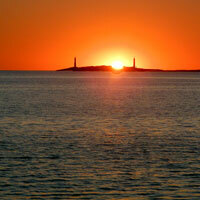 The iconic view of the North Lighthouse at sunset. 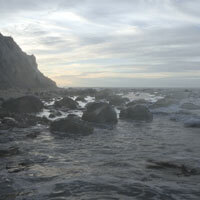 I fished Black Rock on a morning incoming tide. 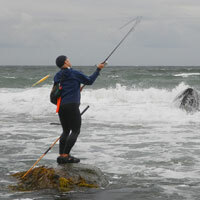 The first time I ever did that, in 2004, big Stripers were clobbering my plugs on every cast. This morning, in pretty good conditions, I had one splash. I tried a few different rocks, and a few different plugs - but that was it - one lousy splash. 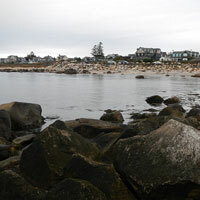 The rocky waters at Black Rock Pt. The last couple years SW Point has not been what it used to be. At least for me. In years past, a setting sun combined with an incoming tide meant aggressive top-water action with 25-34" bass and 6-10 lb bluefish. Last year, I got a few decent hits but didn't hook up, but mostly there's no action at all. 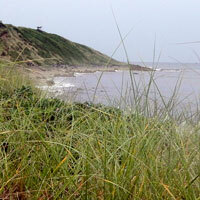 The water was a little weedy on this day, but still I should have found some action and there was none. Hope it comes back because it's a pretty special spot. SW Point shot from the path at the end of Cooneymous Rd. 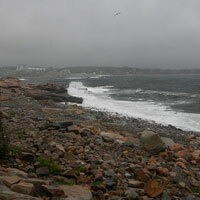 It's a nasty little walk out there on a rocky beach. I dragged Nico and Giulia to Charleston Beach for sunset fishing. The water was very weedy, so plugs had to be cleaned after every cast and we had no action at all. Not the right night to bring the kids. Doesn't make fishing seem like very much fun. On the 2nd night on BI, I wanted to get a fish for a family dinner, so I picked up some eels and went out for some nighttime fishing at a favorite spot on the north part of the island. With a new moon, it was a nice dark night but it was still slow, and I only managed 3-4 stripers between 30 and 33 inches. I took the 33" fish to the fillet station and it was dinner the next night. It's not easy to get a 14 year old to get up at 3:00 am in the summer. So, I try to only ask Nico to come out with me when I'm pretty confident we will catch fish. 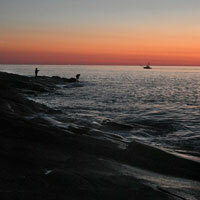 The Blues had been off the rocks in Rockport for a couple weeks at first light. They had been there Wednesday morning. So, I told Nico we would catch big blues and we didn't need to wear waders and he agreed to come along. First light came and it was dead. Never a hit or any sign of fish. And it was Simona's birthday, so now my son, with three hours sleep, would be a zombie when we go out to dinner in the evening. Oh well - catching fish is never a sure thing. 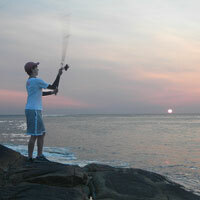 Nico casting in Rockport at sunrise. Tried a spot in Rockport that's known to the fisherman as a big Bluefish spot. And, sure enough, there were some nice size blues there. They showed up at first light and hung around for about 45 minutes. I fought five of them, but landed only two. Finally made my first trip to the north shore - Cape Ann. 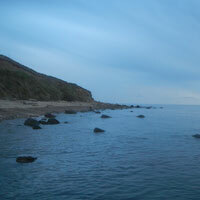 I fished a spot on the backshore on a lovely morning with a nice wind at my back helping me cast a long way. Never got even a swirl. Will try another spot on Wednesday. On a very foggy/misty morning, I was skunked at the Canal for the first time this season but it required a little bad luck. I started behind the ice rink and it was definitely slow. Between 5:00 and 6:00 I got three good hits on my pencil popper without hooking up, and then I had a nice fish on that I dropped. At about 6:30, with the sun bright, I moved to the east end of the Canal where I got one more hit in an hour of casting. I didn't see anyone even hook-up on this morning. Picked up a NYT and then Leo's for breakfast. 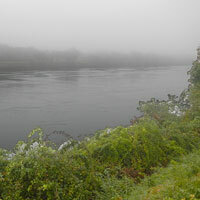 A cool shot of the Canal looking eastward on a misty July morning. Every time I make the effort to get to the Canal early enough to fish an hour in the dark I am rewarded with one schoolie - usually on a white sluggo. This morning was no different. Only a handful of fisherman behind the ice rink on this full-moon morning. As soon as there was a little light, I put the mackerel pattern pencil on and I had a big splash on my first cast which got my adrenaline going. Two casts more and I had one of those tremendous surface hits that top-water fisherman live for. And I had a really good fish on. I let it run a little because there wasn't anyone on my right and then I horsed it slowly in. 42" and probably 27-28 lbs. A few more casts and I caught a 34" fish and that was it. I drove to the other side of the canal, near the east end, and I fished another hour but it was pretty dead there. Darren and I went out at 11:00 for some serious night fishing. We fished behind Ballard's on the sandy beach. I've caught some nice fish there over the years using swimmers and needles. There were great conditions and I was very optimistic, but we didn't have much luck. We worked our way to the end of the beach and back again but found little action. Darren had a couple good hits and had one fish for a few turns and i caught a schoolie and dropped another one. That was it. Good thing I don't have to make my living as a guide. I forgot to take pictures this night so here's a stock shot of Ballard's Beach. On our first night on Block, my kids and their cousin, Darren, wanted to fish sunset, but there were really lousy conditions. As the sun set, we drove to Charleston Beach and found dead low tide and a brisk wind pushing tons of weed right at the shore. We turned around and drove to Grove Point where the water was cleaned but there wasn't enough water to cover the rocks. I decided it was a practice night and I got everyone rigged up and casting a small popper. Not even a splash, but all the kids did pretty well. I was impressed that I had enough stuff to outfit four fisherman pretty nicely. I met Grigoriy behind the ice rink to fish the Canal. At about 5:00 the fish came through and Grigoriy caught three nice fish to just one for me. Most of the fish were about 37". After it died, Grigoriy suggested we try another spot and we drove near the end of the Canal where a lot of guys were still fishing. We found a spot and, using my trusty mackerel-pattern pencil popper, I hooked up on my 3rd cast. I ended up getting four good fish there up to about 25 lbs and Grigoriy, fishing on my left, didn't have any luck. The Canal is a pretty special place to fish in June. Here's Grigoriy fighting a 20 lb Canal striper. The magic time at the Canal was 4:00 am, but I didn't plan well, and I didn't get down there until 4:30. I also forgot how early it gets light this time of year. So, when I arrived, there were 100 guys down there and at least two had nice fish on as I walked in. I had to walk a long way to get a spot, and then that spot was stolen by a frantic guy on a bike. When I finally settled in, a big fish swallowed my mackerel pattern popper on only my 2nd cast. Long fight against the current and I landed a fat 42" striper with an 8" tinker mackerel in his mouth and many more in his belly. The water was full of those little macks. I weighed the fish on my hand scale at 31 lbs. By the time I got the plug out of her throat, she was a goner and the fishing had died down - in fact I didn't see anyone hook up after that. About an hour later, another nice fish hit my plug but I dropped it after about 20 seconds and Paul and I went to breakfast. This big girl will make a lot of nice kebabs and fillets. Went back to BI on a Sunday afternoon for a few more days of work on the west side house and I fished Charleston Beach at sunset. Would turn out to be the only time I would get out. There was some kind of fly-fishing club working the beach with more than 20 guys. There was bait in the water and fish were showing but they wouldn't touch anything I threw out there. The fly guys had no luck either. 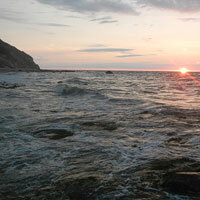 After, senset, I stayed and fished the rocks in the dark for at least an hour and never had a bump. The distant fly fisherman was the first of what would become at least 20. Back to the Canal. Heavy fog and only a handful of fisherman. After an hour of casting blind into the fog, I hooked and landed a nice 39" striper. I caught a 32 incher about 15 minutes later and had a couple other hits. The fog never lifted while I was there and I quit about 7:30. Another 20+ lb Canal Striper. Last year I did very well in June at the Canal if I remembered to watch for the right current and tide conditions. Millions of fisherman down there on this Tuesday morning. I found a spot and the fish showed up right at the expected time although they never really showed like they usually do. Using a 2 oz, Mackerel pattern pencil popper, I hooked and landed a 37" and a 42" striper. I also dropped a couple pretty nice fish. A lot of guys caught at least one nice fish. First 20+ lb striper of the season. Last night of this trip and I really wanted to catch fish. This time, after the basketball game, I went to my favorite spot on the east side at about 10:30 with a nice SW wind at my back. I put on a reliable black needle and there was pretty good action. In two hours I caught four fish from 30" to 35" and had several more hits and dropped a couple. It felt great to catch some fish and I took some fillets home on the boat to share with my family. Got out for the first time this season. After a long day of painting at my place on BI, I fished sunset at Charleston Beach. Fished my way all the way to the right and then fished the whole way back and all I had was one splash, no fish. 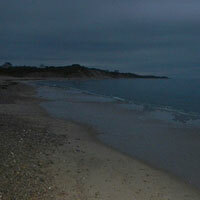 As I walked off the beach at dark, several guys arrived and told me the nighttime fishing has been very good. However, the Celtics playoff game was more important on this night. Big tree washed up on shore at Charleston Beach.